Your correspondent is in Tampa for a week that commenced with his 45th year high school reunion (coincident with a ceremony marking the 50th anniversary of his now truly grand old school) and will conclude with the celebration tomorrow of his mother's 93rd birthday. This raised two questions in my mind. One was, "Why did the Tudors rate two beasts?" The second, and more immediately compelling, was, "What the heck is a yale?" 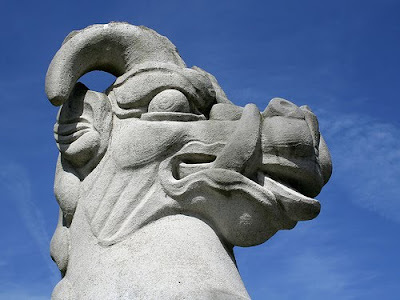 The yale was a mythical beast, said to be white in colour and covered with gold spots. It's [sic] peculiar characteristic was that it could swivel each of its horns independently. It de[s]cends to the Queen through Henry VII, who inherited it from his mother, Lady Margaret Beaufort. The shield shows a portcullis surmounted by the arched royal crown. The portcullis (uncrowned) was a Beaufort badge, but was used both crowned and uncrowned by Henry VII. Now I know of another member of the mythical bestiary, as well as to continue to rely on Google. I think the tenuousness of his right to the throne spurred Henry VII to acquire TWO beasts to pull the carriage of his [Tudor] name. One mythical and one natural, no less.